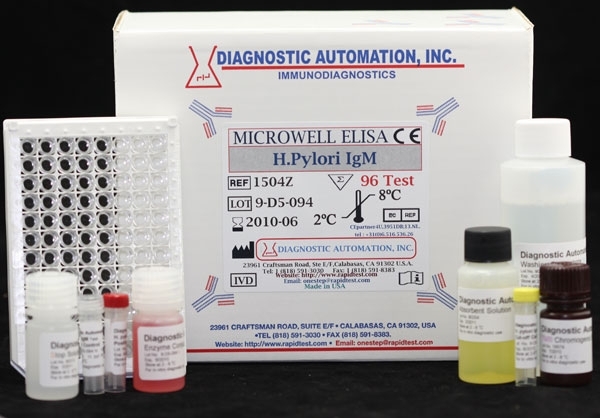 Diagnostic Automation Inc. offers a Syphilis (TPA) IgM ELISA kit, which is an enzyme-linked immunosorbent assay for the qualitative and semi-quantitative detection of IgM-class antibodies to Treponema palladium in serum. The Syphilis (TPA) IgM ELISA kit, like many Blood Bank ELISA kits, is for in-vitro diagnostic use only. As in other Blood Bank ELISA Kits, the Syphilis IgM ELISA Kit is designed as an aid for screening of blood donors, and as an aid in diagnosis of symptoms related to infection with Syphilis. 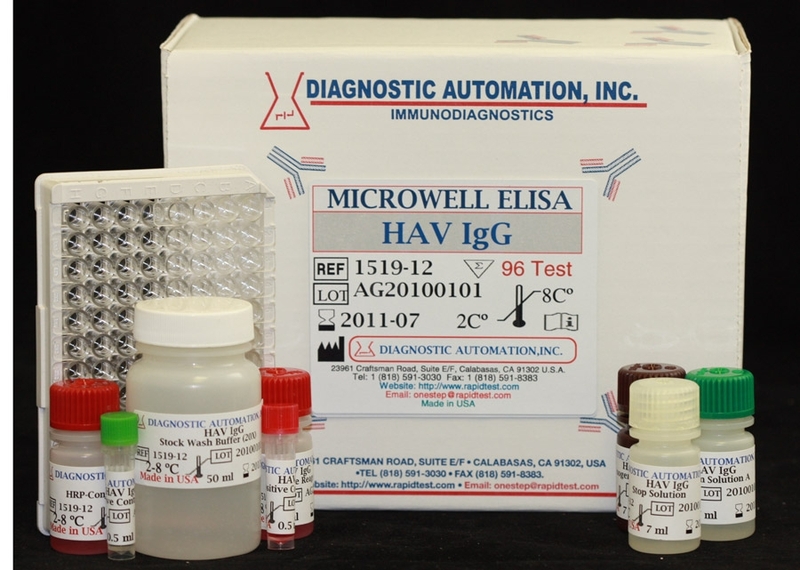 The Sensitivity of the HCV IgM ELISA kit is 95% and the Specificity is 95%. Syphilis is a disease, usually sexually transmitted, caused by infection with the spirochete Treponema pallidum (T.pallidum). Infection is systemic from the outset and the disease is characterized by periods of latency, often in excess of twenty years. These features, together with the fact that T. pallidum cannot be isolated in culture mean that serological techniques play a major role in the diagnosis of syphilis and treatment follow-up. Syphilis IgM elisa is an enzyme-linked immunosorbent assay for the qualitative detection of antibodies to Treponema palladium (TP) in human serum/plasma.The Syphilis IgM enzyme immunoassay format allows use of a micorplate reader which eliminates subjective interpretation of results and the diagnostic test for syphilis can be automated for high-volume testing. The DAI Treponema pallidum IgM ELISA Kit is a solid phase enzyme-linked immunosorbent assay (ELISA). Sample Diluent is used to dilute patient samples, and then incubating with IgG-RF-Sorbent, containing hyper-immune anti-human IgG-class antibody to exclude competitive inhibition from specific IgG, and to remove rheumatoid factors. This pre-treatment avoids false negative or false positive results. Microtiter wells as a solid phase are coated with Treponema pallidum antigen. Pretreated patient specimens and ready-to-use controls are pipetted into these wells. During incubation, Treponema pallidum-specific antibodies of positive specimens and controls are bound to the immobilized antigens. After the washing step, that removes unbound sample and controls material HRPconjugated anti-human IgM antibodies are then dispensed into the wells. During the second incubation, this anti-IgM conjugate binds specifically to IgM antibodies that forms enzyme-linked immune complexes. For additional details please refer to the instructions for use. Product inserts for most Infectious diease ELISA kits follow a similar method. See the Syphilis (TPA) IgM ELISA Kit product insert for details on preparation, procedures, quality control, and test result interpretation. 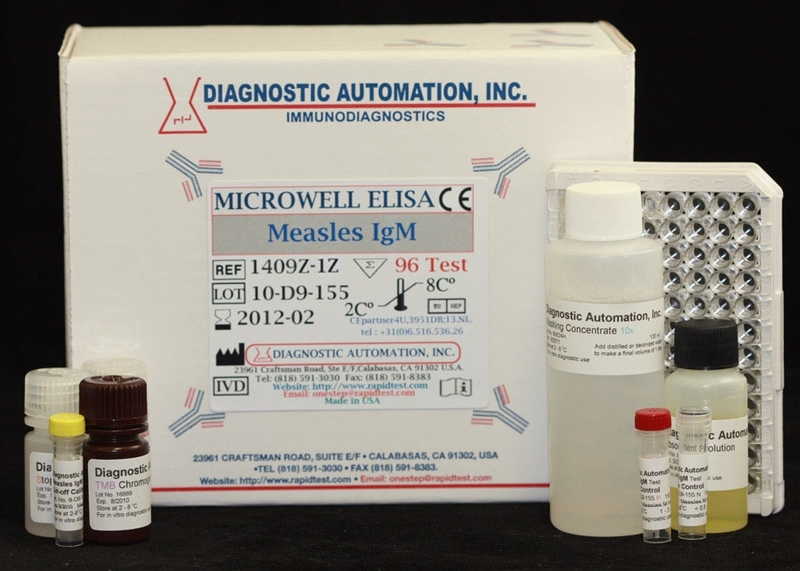 Diagnostic Automation also provides other Infectious disease ELISA Kits. 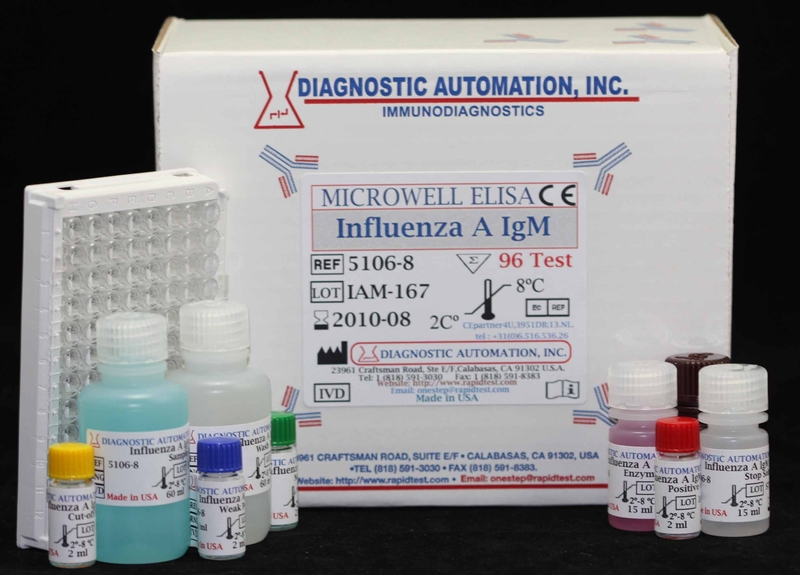 For more information about ELISA Kits, Rapid Tests, IFA Kits, CLIA Test Kits, or Serology tests, please see our website home page, or contact our Customer Service Representatives at 818-591-3030.